Cara Hoover, a sophomore double-majoring in art and psychology, makes portraits of her friends to teach us about close personal relationships. 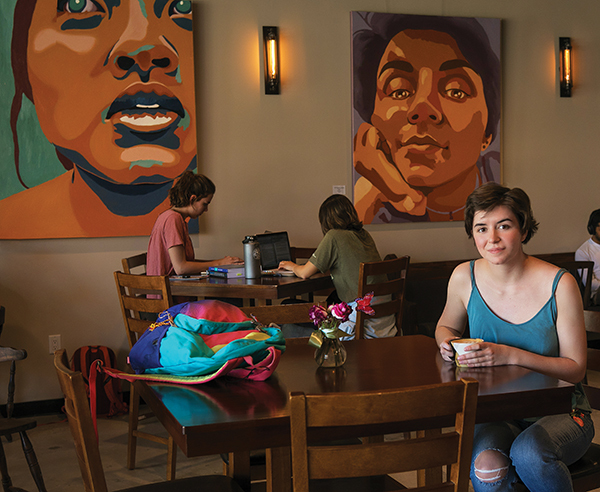 Three of her paintings will be on indefinite display 10 minutes from campus at Five07 Coffee Bar & Eatery now that the owners, Amber Devolites and Sean McCarthy ’15, are buying them to decorate the long wall at their new business. Devolites and McCarthy, who have been expressing themselves lately with exceptional breakfast crepes and avocado toast, are to be married in May. Painted on heavy squarish panels, Hoover’s portraits offer dramatic perspectives on their young subjects, roughly the view from a cup of coffee. The angles and the large size of the paintings lend feelings of intimacy. Hoover exaggerates features and especially shadows with her contrasting and heavily saturated tones. She offers closeness but not depth in these paintings, a choice that marks a phase in her budding career. Located adjacent to Vons at 2036 E. Avenida de los Arboles, Suite C, Five07 Coffee Bar & Eatery is open 7:30 a.m. to midnight seven days a week (see thefive07.com).